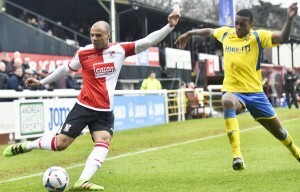 WOKING began their Easter schedule with a steadying stalemate against relegation favourites Kidderminster Harriers on Saturday afternoon. A 15th-minute opener from loanee Danny Carr – his first goal for the Cards – looked to be enough to bank a first win at Kingfield since 2 January. However, despite being a mountainous 11 points adrift of safety ahead of kick-off, Kiddy’s players are refusing to accept that their game is up for this season – livewire winger James McQuilkin earning Harriers a rare point after his fine drive from distance hit the back of the net with 11 minutes to go. Followers of these familiar foes will have enjoyed more thrilling 90 minutes of action over the years – past Conference and cup clashes seeming a world away on a rain-soaked Saturday in GU22. visitors – with both sets of supporters being treated to some slick passing moves on a damp Kingfield surface. For Woking, Jake Caprice seemed back to somewhere near his marauding best after a spell on the sidelines – his battle with Harriers’ equally attack-minded full-back Lewis Kinsella one of the highlights of the clash. Pacy Caprice had almost nicked an unlikely opener when his flashed cross cannoned back off the outside of Kiddy keeper Max O’Leary’s left post, before Carr found the net with a well-executed low drive from a Keiran Murtagh knock down inside the penalty area. Scorer Carr then spurned an altogether easier chance from another Caprice centre when he miscued from two yards out; while a neat and tidy Kidderminster side crafted shots on target for forwards Arthur Gnahoua and Ben Whitfield before the break. Sensing a way back into the game, Harriers boss Colin Gordon made a double attacking substitution for the final half hour. Having survived a scare when impressive youngster Matt Butcher clipped the crossbar for the Cards, Kiddy reaped their reward when a charging attack was finished by McQuilkin – blasting past Jake Cole from 20 yards. A first league point since 30 January should now, mathematically, secure Woking’s safety for another season as they reached the so-called ‘magic 50’ points tally.